Are you suffering from a series of yellowish or reddish growth beneath the skin? Chances are that you might be suffering with Lymphangioma. Read on to know about the types, symptoms, causes, diagnosis and treatment of this disorder. It is a benign, focal malformation of the lymphatic system, with three-fourths of all the cases occurring in the head and neck region. However, it can be found in the intestine, pancreas, and the mesentery. It is generally a rare and congenital tumor that involves the skin and subcutaneous tissues. Such malformations can occur in any individual, irrespective of age, race or gender. Lymphangioma is often associated with chromosomal aberrations like Turner syndrome. Typically, it consists of multiple, intertwining lymph vessels in a loose fibrovascular stroma. The condition is also referred to as Cystic Hygroma. It is generally an embryologic malformation and may cause fetal death. Around 90% of the cases have been reported in children below the age of 2 years. It is usually uncommon in adults as they normally emerge early in the process of fetal development. However, there have been few cases of a certain type of Lymphangioma appearing in adulthood. It can be classified into four types on the basis of their microscopic characteristics. It is also denoted as “Simple lymphangioma” and typically occurs in the head, neck and axillary subcutaneous tissue. It comprises of small, capillary-sized lymphatic vessels. Sometimes, it may arise on the trunk and within connective tissue of the soft internal organs of the body, especially those within the abdomen and thoracic cavities. It appears as nodules or well-demarcated, compressible gray pink visceral masses on the epidermis of the skin. Under microscopic observation, it appears to be made up of a network of large, endothelial-lined fluid-filled spaces and is identifiable only by the absence of blood cells. 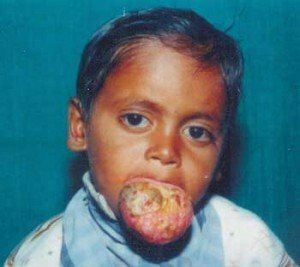 It is the most common form of Lymphangioma and is also known as “Cystic hygroma”. It is characterized by large cyst like cavities, and is normally filled with straw-colored, protein rich fluid. It appears as a skin colored, red or bluish, slightly transparent swelling under the skin. It predominantly affects the neck, armpits or groin. Large lesions may involve the chin and face and could interfere with eating or breathing. Congenital disorders like Turner syndrome, Down syndrome and Fetal Alcohol Syndrome are usually manifested by such macrocytic lymphatic malformation. Hence, the condition mainly affects children and is rarely present in adults. It can occur in any region of the body, including the tongue and is composed of dilated lymphatic vessels. It appears as a skin colored, red or bluish rubbery inflammation under the skin. In infants, the growth rate gets accelerated and can be distinguished from the other types by the presence of clear fluid within the vessels. This is a microcytic lymphatic malformation unlike Cystic Lymphangioma and is manifested by a cluster of tiny firm abscesses filled with lymph fluid, identical to frogspawn. The color of these blisters may range from clear to pink, dark red, brown or black and may turn warty while affecting the palm or sole. It is most commonly found to arise on the shoulders, neck, armpits, limbs and the mouth. It is usually prominent at puberty and may often start bleeding. It is a benign malformation of both lymphatic and blood vessels. 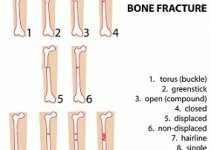 It may invade the adjacent muscle, bone and the underlying tissue, which may lead to serious deformity. Axilla, abdominal cavity and urinary bladder are the majorly affected organs. Lymphangioma can be classified into three more types on the basis of the size of the cysts. It comprises of smaller cysts, which measures less than 2 cm3 in volume. In this form of lymphangioma, the cysts measures more than 2 cm3 in volume. It consists of both smaller and larger cysts. This particular condition develops through five distinct stages and varies according to the location and extent of the disorder. The classification is done on the basis of the location of the lymphatic malformation with respect to the hyoid bone, which is a U-shaped bone situated directly beneath the tongue. This malformation is located below and on one side of the hyoid bone, and is called Unilateral Infrahyoid. In the second stage, the lesions are present above and on one side of the hyoid bone. This stage is commonly called Unilateral Suprahyoid. In this stage the malformation spreads above and below the hyoid bone but only in one-sided direction, and is called Unilateral Suprahyoid and Infrahyoid. In this case, lymphangioma is present superiorly on both sides of the hyoid bone and is known as Bilateral Suprahyoid. In this stage, the malformation is located both superior and inferior to the hyoid bone in the bilateral direction. It is known as Bilateral Suprahyoid and Infrahyoid. This type of lesion was first described by Redenbacher in the year 1828. The first case of this disorder was reported in the year 1843 by Wernher, which was of cystic hygroma. The word “hygroma” was derived from the Greek terms “hygroth” meaning fluid and “oma” referring to tumor. In 1965, these lesions were proposed to be variations of a single entity. The nodules are now grouped according to their location on the body. The condition is commonly characterized by elevation of various areas of the skin, formation of pinkish-white lumps in the mouth and painless lesions. However, there are some additional symptoms affecting the internal organs of the body. This commonly occurs in Capillary Lymphangioma where one of the lymphatic vessels gets dilated causing partial or complete blockage of the bowel. In this way, the intestinal contents undergo difficulty to pass through. This often leads to abdominal distension and discomfort. It also known as lymphatic obstruction and causes localized fluid retention and acute swelling of the shoulders, neck, face, limbs, and throat. It is generally observed in Lymphangioma Circumscriptum. Abdominal pain often generates forceful expulsion of stomach contents, owing to the dilation of lymphatic vessels. It is a rare abdominal tumor and is most commonly found in the small bowel mesentery of peritoneum that connects the loops of jejunum and ileum. It is generally accompanied by intermittent fever and chills. The retroperitoneal space in the abdominal cavity present behind the inner lining of the abdomen is often prone to severe inflammation. This essentially happens due to malformation of the abdominal lymph vessels. This particular disorder tends to start in the superior and nasal orbital of the eyes. Lymphangiomas may bleed into themselves, causing blood-filled cysts. If these cysts develop behind the eye it may push the eye forward. Blood filled lymphatic channels can be seen beneath the conjunctiva, which are known as “lymphangiectasias”. In the fetal stage, the lymphatic system undergoes blockage and many of the symptoms are not displayed until birth. This blockage is mainly attributed to maternal alcohol use and viral infections, due to which the lymph sac remains separated from the rest of the lymphatic system. Genetic disorders like Turner syndrome, Down syndrome, Noonan syndrome and trisomies 13, 18, and 21 are directly associated with cystic lymphangioma. Large cysts generally evolve during the first two trimesters of pregnancy. Biopsy of the fluid from the cystic lesions is usually carried out to detect cystic hygroma. Prenatal ultrasound is important to determine the size and the type of lesion. This is sometimes, followed by amniocentesis where the amniotic fluid is tested for any chromosomal abnormalities or infections. Lymphangioma is usually treated for cosmetic reasons, since it has no chance of turning malignant. It is found to be least responsive towards radiotherapy and steroids. In case of lymphangioma circumscriptum and cavernous lymphangioma, the drainage of the fluid is found to give a temporary relief. Hence, surgical removal of the lumps is normally advisable. The abnormal tissue formed during Cystic Hygroma is generally removed, which may require at least two procedures. There are chances of recurrence but it happens only in those situations where the lesions are not removed completely. It is considered to be the most effective form of treatment and involves a least invasive procedure. Here, a sclerosing agent such as sodium tetradecyl sulfate, doxycycline, or ethanol is injected into the lymphatic vessels, which makes them shrink. OK432 (Picibanil) is another sclerosing agent which is used to treat cystic hygroma. It uses an organic fluorescent dye mixed with a solvent as the lasing medium. A stream of light from a fast discharge flashlamp is made to fall on the damaged tissues, which destroys them completely without affecting the adjacent tissues. However, this technique may cause port-wine stains and other vascular lesions. Lymphangioma is commonly diagnosed in infants. However, it normally poses little health threat on them and is often treated only for cosmetic reasons. In severe cases, where there is minor bleeding or lymph fluid leakage, immediate medical attention is needed. I am 21 years old, (I am a female) and I have Lymphangioma and I learned a lot from this site. it’s great!